Wow! Tasty & Simple Turkey! As the title says, this recipe is simple and absolutely delicious!! The recipe comes from one of our favorite cookbooks in the farm kitchen, Long Way on a Little by Shannon Hayes (also available in our Farm Store). 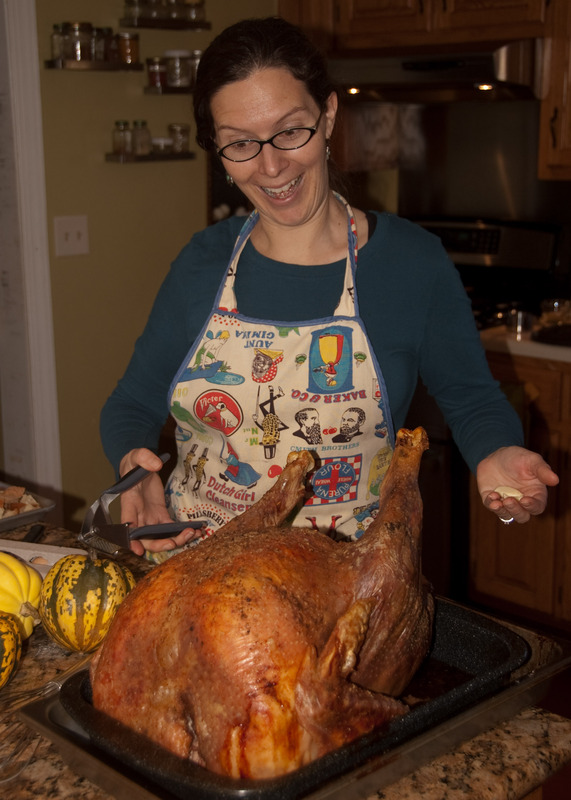 Shannon also has a great post about pastured turkey cooking tips HERE. Preheat the oven to 325F. Set the turkey in a large roasting pan, breast-side-up. Insert the onion, carrots, celery, bouquet garni and garlic into the cavity. Melt 6 ounces (1 1/2 sticks) of the butter and pour it over the surface of the skin, then sprinkle all over generously with salt and pepper. Put the bird in the oven and roast for 8-10 minutes per pound, until the internal temperature of the breast is 165 degrees. If the leg meat is not 165 degrees when the breast meat is done, don’t panic. Simply carve off the legs and put them back into the oven to cook a little longer while you carve the breast meat.